Not sure what you did over the 4th of July weekend but I’m sure it had to do with some kind of barbecue and some kind of alcoholic beverage. 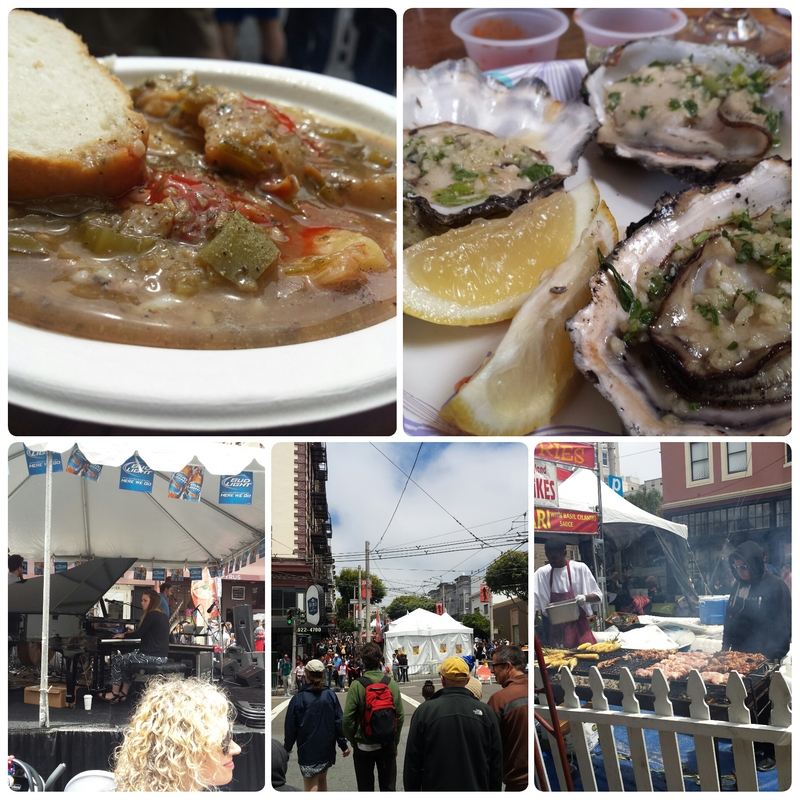 A huge chunk of the Bay Area population made their way to the Fillmore Jazz Festival in San Francisco to enjoy food, drinks and excellent live Jazz music. One of the reasons so many people show up is not just because of free Jazz music but also to make sure they can kill off time during the day so they can enjoy the fireworks at Pier 39 at night. I tell ya.. There is no better way to enjoy a sunny day in the Bay Area than with an IPA in hand with authentic Jazz music and the smell of all kinds of grilled up tasty sensations all around you. One snack that goes great with a beer is BBQ Oysters; which this year I got my taste buds reactive to this seafood delicacy at Aroma Concessions. First off let me say that these oysters were huge! Three of them took over my entire plate. The blend of garlic and herbs and butter over it while it sizzled on the grill was a perfect masterpiece! The oysters were tender, moist and with the blend of the garlic each bite really made a impact in the flavor. No doubt about it; one of the best barbecued oysters I have had! Good job Aroma Concessions! After another beer or two it was time to see what is next for my curious palate. I glanced at the horizon and I saw a vendor with creole food extravaganza. The menu consisted of chicken & sausage jambalaya, crawfish ettouffee, seafood gumbo, blackened shrimp, and red beans and rice. My eyes twinkled a the sight of gumbo, especially since they had crab meat blended in, so that was going to be the choice of the day. According to their description, it is a spicy seafood soup made with a blend of seasonings with lots of shrimp, cod and crab meat. Let me just say that their description was on point and ‘Yes’ it was flavorful and ‘Yes’ it was hearty! Chunky seafood that tasted fresh, seasoned and blended in the soup superbly. What a great meal to go with the echoing of authentic Jazz playing in the background! True live action eating! Good job New Orleans Catering! If you have never had the chance to attend the Fillmore Jazz Festival then you should definitely try to catch it next year. I promise you that you won’t be disappointed! < Previous The Music goes Boom Boom Boom at the Redwood Room! Next > Mendoza’s on McKee is the place to be!